So you have your beautiful venue booked, the dream dress purchased, colour scheme agreed, tasted the most delicious food, organised your bridesmaids and ushers, selected the best photographer (Joshua of course) and all the other hundred and one things you need to do, to have the most perfect day of your lives but what about choosing your wedding rings? Wedding rings are the most significant piece you keep after your wedding and you look at every day for the rest of your life. They are a symbol of your love for one another and represent the commitment you have made to spend the rest of your lives together. Your wedding ring will become one of your most prized possessions as it holds the most magical memories. At Peter Jackson, we understand the importance of this and want to help you find the perfect ring. Our wedding ring selection is from a London based company, Brown & Newirth, who were established in 1967. 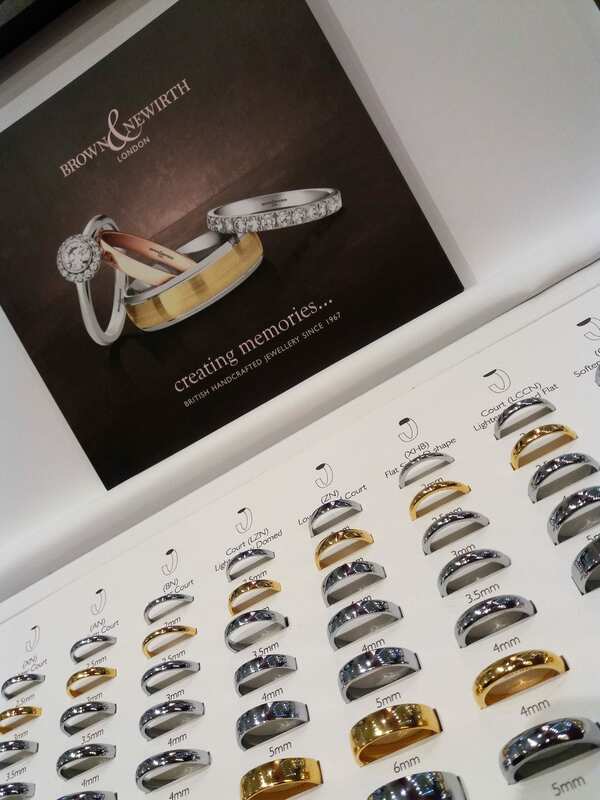 They have been handcrafting rings for over 50 years and provide a lifetime care package with each ring to treasure your memories forever. Choosing a wedding ring can feel like a daunting task but with our helpful steps and questions, we intend to make it the easiest purchase on your wedding checklist. Firstly your engagement ring does not need to be the same metal as your wedding ring. It is an old wives tale that if you have two different types of metals together they will wear each other away, this is not true. Any metal will wear over a very long period of time however if you take care of it, it will last a lifetime. The most important factor to consider when choosing a metal is your lifestyle or profession as you want your ring to last forever. For example, a builder will need a stronger metal to withstand damage so choose platinum, palladium or titanium. A hairdresser, white gold would not be suitable as it has a rhodium coating to make it bright white which strong chemicals can easily remove. This is the fun bit! Everyone has their own unique take on jewellery and this is why we offer so many different options. There is no wrong or right when it comes to ‘what is a wedding ring’. The first examples of wedding rings were from ancient Egyptians from over 600 years ago and they were made from woven reeds. 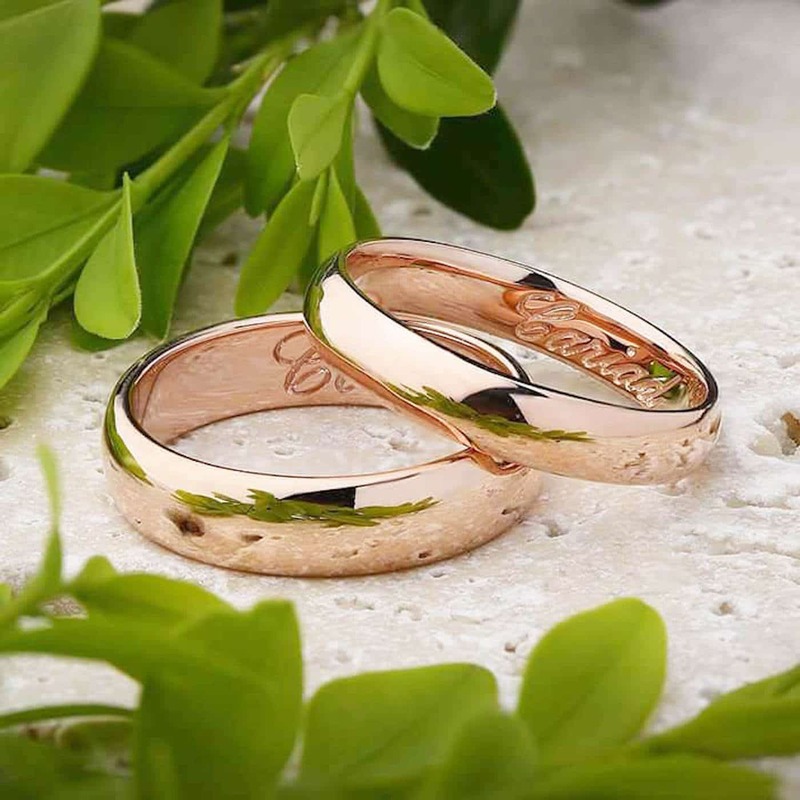 Your wedding rings represent a circle of eternity and the love between you both. The tradition of wearing it on your left hand comes from people believing a special vein ran from it to your heart. 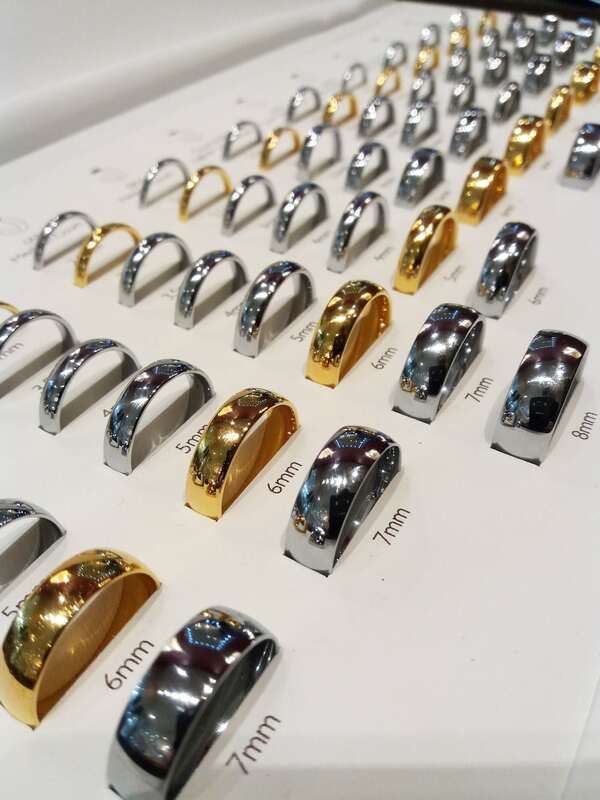 A wedding ring can be any colour metal, any shape, style or width. It can be sparkling with diamonds, adorned with gemstones or plain and simplistic. When you visit us in store we help you discover which ring will be perfect for you by getting to know you both as a couple and your individual tastes. We can work to any budget and we also offer payment plans as we know a wedding can be expensive, we are here to help in every way we can. Don’t panic! We work alongside a fantastic design company who will make you a unique, handmade ring to fit snugly with your engagement ring. We can have a wax ring model and hand-drawn images sent to the store before you make your decision too. In the future, this can also be replicated into an eternity ring too! They will also design your dream ring if we don’t have it. I have seen them make Tiffany inspired rings or designs customers have created themselves from handcrafted drawings or just from their imagination. Anything is possible! Most of our wedding rings can be engraved with special messages or the date of your perfect day. This can be done on the inside of the band to keep it precious to you or the outside to show the world. We can now even have your loved ones fingerprint laser engraved on the inside of your band so you have a piece of them wherever you go. All boxes can have a special personalised plaque attached, with anything engraved, whether its rings, or wedding gifts, these can be kept and cherished forever. All of our Brown & Newirth rings come with a TLC promise package. This offers resizing (where possible), refurbishing and engraving. All you need to do is bring your ring and your paperwork to us and we will take care of the rest. As a family run company that has been established for over 30 years, we pride ourselves on customer care. Old, new or bought elsewhere we will always do our upmost to help you take care of your precious jewellery. We offer cleaning and refurbishment in store. We can repair any jewellery and have it restored to its former beauty. I hope these helpful tips and information help you to find your perfect ring and you are more than welcome to pop in and see me for any further help or advice. I have over 7 years experience in the jewellery trade and I love meeting excited couples planning their big day! I am still coming up with new combinations of rings and being inspired by people like you. To everyone who has read this I hope you have the most magical happy ever after.